Hannah Mouncey has choice words for AFL regarding local leagues. Why Hannah Mouncey is not thanking the AFL for allowing her to play in local leagues. 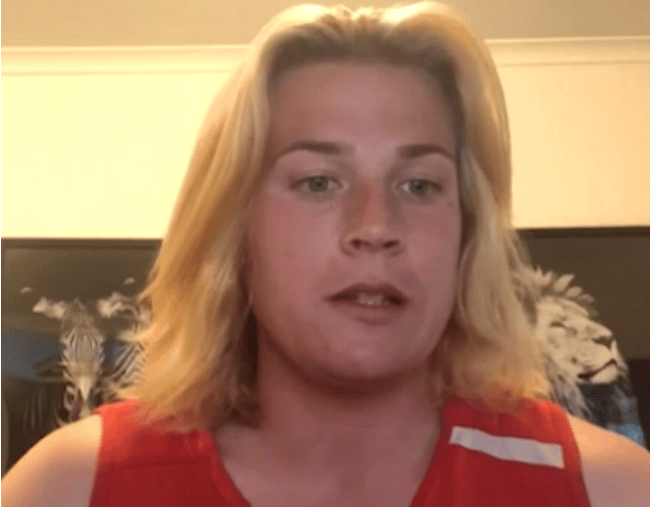 Transgender footballer Hannah Mouncey has hit out at the AFL over its handling of her issue, calling it a circus that could have been avoided. On Tuesday, the AFL announced Mouncey could play in local women’s leagues as its gender diversity policy is finalised. The AFL had blocked Mouncey from entering last year’s AFLW draft after she had played for Ainslie in the ACT women’s league. Watch: Hannah Mouncey on why she won’t be thanking the AFL for allowing her to play footy. She now wants to play in Victoria against the state’s top AFLW talent. “So after all that; guess who’s allowed to play football after all,” Mouncey said in a tweet. Mouncey then issued a lengthy statement, where she welcomed the AFL decision and said she looks forward to hopefully playing this season. “While I wholeheartedly thank those who supported me through this time, I will not and I think it would be inappropriate for me to thank the AFL for allowing me to do something open to every other Australian,” Mouncey said. “The science and research has supported (this decision) all along. “Had we simply gone by the research at the start, we could have avoided the whole saga that has taken place completely. She added the line of questioning and “circus” around her issue over the last four months has highlighted a lack of understanding around the science of gender transition, which Mouncey understands. “But more importantly and worryingly, it showed a disturbing willingness by those who don’t understand it to dismiss research and evidence,” she said. Mouncey called for more health support for people going through gender transition, plus their family and friends. She also feels that the issue became much more than her bid to play in an AFL women’s competition. “Yes, the AFL may prefer that I did not exist or chose to go and do something else, but that it is not how it is and we are not people to be ignored in the hope that will happen,” Mouncey said. Mouncey played men’s handball for Australia before starting her gender transition. The AFL said on Tuesday that the decision to not let Mouncey enter the draft only applied to last year. “Eligibility decisions are generally made by state and local leagues in accordance with the rules and policies of the relevant football body,” the AFL said in a statement. The AFL said it is seeking advice from the Australian Sports Commission and the Australian Human Rights Commission on the issue.